The wonders and advantages of modern age electronics and the World Wide Web have also, unfortunately, ushered in a new age of terrorism. The growing connectivity among secure and insecure networks has created new opportunities for unauthorized intrusions into sensitive or proprietary computer systems. Some of these vulnerabilities are waiting to be exploited, while numerous others already have. Everyday that a vulnerability or threat goes unchecked greatly increases an attack and the damage it can cause. Who knows what the prospects for a cascade of failures across US infrastructures could lead to. What type of group or individual would exploit this vulnerability, and why would they do it? 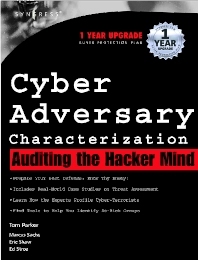 "Inside the Mind of a Criminal Hacker" sets the stage and cast of characters for examples and scenarios such as this, providing the security specialist a window into the enemy’s mind - necessary in order to develop a well configured defense. Written by leading security and counter-terrorism experts, whose experience include first-hand exposure in working with government branches & agencies (such as the FBI, US Army, Department of Homeland Security), this book sets a standard for the fight against the cyber-terrorist. Proving, that at the heart of the very best defense is knowing and understanding your enemy. This book will demonstrate the motives and motivations of criminal hackers through profiling attackers at post attack and forensic levels. This book is essential to those who need to truly "know thy enemy" in order to prepare the best defense.
. The breadth of material in "Inside the Criminal Mind" will surprise every security specialist and cyber-terrorist buff of how much they do and (more importantly) don't know about the types of adversaries they stand to face. Security junkies interested in cyber-terrorism, especially those wanting to know the type of hacker and degree of danger involved in leaving cyber-terrorism unchecked.